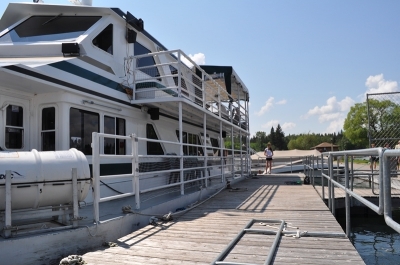 Transporting a 22 x 62 structure in Manitoba would not be a big issue…but moving a 22′ x 62′ x 20′, 75,000lb, dinner cruise boat from British Columbia to Manitoba proved to be a bigger challenge than anyone could have ever imagined! Sheldon and Eugenia Willey, the owners of Marina on Clear Lake worked for one year getting approval from the National Park to operate a cruise boat on the lake. Once this was accomplished the next hurdle was to find a boat (which they found in BC). Unfortunately they were told that the boat would not be for sale after all. Plan B-build one in Manitoba. However, this proved to be far too costly. At about this time Plan A once again became available. Thinking that it would not be a problem transporting back to Manitoba, the boat was purchased. Then the fun began! And Minty’s Moving was contacted. 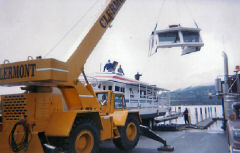 The upper level of the boat has been cut apart from the lower and a crane is assisting with the transfer of the top to a waiting trailer. This section was hauled, as a separate load, a week after the boat arrived in Manitoba. Harold started seeking approval, quickly learning that we were going to run into a lot of obstacles, starting in British Columbia. First off we were told that we could only move from 2-5am. We assured the permit office that this would not be a problem. Next we were told that permits were only granted for 100km moves. Once again we were okay with this rule (we thought we could travel 100 km/night – wrong). Then we were informed that we would not be granted any permit through the mountains. Plan B-transport by rail, not an option – snow tunnels not high or wide enough to allow the boat to go through. Back to the drawing board and the BC permit office. 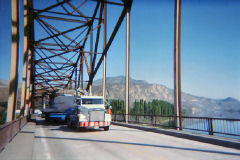 They finally agreed to allow us to haul the boat from Kelowna to the Washington border, dependent upon us receiving approvals from all the power, telephone, cable companies and the RCMP (which proved interesting when you are trying to accomplish this from Manitoba and you have absolutely no contacts or numbers for all the districts and companies that are along the proposed route!). At this time we started working on permits for Washington, Idaho, Montana, Alberta, Saskatchewan and Manitoba. Five applications for an approved route for Washington and our permit was in the process. Idaho was dependent upon Washington, Montana upon Idaho (and Idaho were into their construction frame-no overloads). Idaho finally gave us permission to go between 1 and 5am Sunday, April 25th. Montana, well that’s another story in itself. First we had an approved route on I90 and I15 two weeks prior to the move, then on April 21, cancelled the permit when they realized they had construction on part of I15, not allowing us through with the super-load. The sad part about it was that the permit clerks wouldn’t suggest alternate routes. So we had to just pick a route ad hope that it would be OK. They were not very good about getting back to us quickly. So ultimately we arrived on their border with no permit. Monday morning Harold called the permit office, explained where we were, and needless to say they were not impressed. The good part was that they had to deal with us because the problem wasn’t going away. We finally got rolling at 4:30 that afternoon. Consider this, the time frame for Harold working on permits from BC and our office in Manitoba was probably 50 hours (conservative) each. Here you can see the two sections of the boat ready for transport. On to loading the boat: first off the top had to be removed to get the load down to the required 14′, which the owner accomplished. Next let’s get the boat out of the water. A problem: the loading dock is not long enough for our beams and they got hung up over the end of the concrete. Trucks prove unable to retrieve them, a crane is required to lift them out of the water. Now the boat is out of the water and we can see that the boat was not built in accordance with the engineered drawings. Out comes the welder and we begin manufacturing a system that will work and at the same time not damage the boat and keep our load within legal height. Accomplished! With all our BC approvals in hand, we head out. We reach the border without incident but arriving at 5:00am in the dark, we park at the first open spot, which happens to be someone’s parking lot and they are not too happy. We find a better location and sit till our Washington permit came into effect. Which was good because it gave our crew a bit of a rest and also we found out that we needed a manifest to cross the border, which we did not realize had to be done when the owner was on site with his own goods. Modifications complete, it is smooth sailing for the trek home…British Columbia – Washington – Idaho – Montana – Alberta – Saskatchewan and finally, Manitoba. Good news! Washington State Patrol was excellent at getting us over the route in record time. Idaho was also no hassle. Then we reach Montana. After two days of permit haggling, and three scales (all with different violations), we were finally through Montana. One violation was insufficient lights on vehicles (we had two front and one rear pilots, but we still needed those little lights to proceed). Another minor problem, we were scaled and are overweight due to an error in the boat specifications. Canadian permits must now be revised to compensate for the extra weight. Finally we reach Canada and wide open spaces! The coast is clear and we are heading home, arriving back in the yard only 10 days, and 2600 kms, after starting in British Columbia. A quick return trip to BC for the top that was removed and all the boat is home. A month and a half later, the boat is put back together, once again ready for the water. The Martese on Clear Lake. Daily Cruises all summer. All in all, the move was a great experience, with us gaining much knowledge about moving in the mountains. We experienced a great deal of frustration but also a number of events that assisted us with this project. End result, a successful launch and a great summer on the lake. The Martese is running cruises all summer on Clear Lake. Form more information go to the website.